My mother-in-law works at a home for adults with developmental disabilities and every week, she picks a different theme to plan activities around. This week is 1950's week. She is cooking 50's food, playing 50's music, watching LOTS of Elvis and she has asked me to come in on Friday night and talk to her residents (14 adorable ladies) about fashions from the 50's! A few of the ladies are old enough to remember the 50's and they are ALL Elvis fans, so this should be a really fun theme this week!! So, now I'm brainstorming about what the heck I'm going to talk about!! The Poodle Skirt Craft: I used to work here, so I know these ladies LOVE to do hands-on activities like crafts. So, I'm going to draw a poodle skirt and copy it and have everyone color and decorate their own poodle skirts with ribbon, jewels and things like that. If anyone else has any good ideas for my little 1/2 hour 50's fashion presentation, please do share!! I'm having a hard time coming up with good ideas for this one. Thanks!! It sounds like you have plenty to fill up a half hour! The ladies will probably LOVE playing dress up with your hats and stuff, I know my grandmother would have loved that! Wow, I think your ideas are fantastic! great ideas, thank you!! I do have some 50's magazines with really neat pictures! mention world war 2, as most of these women would be old enough to have lived through it. Explain the 50s as a reaction to the gloom of the war. You could use some photos from blogs to demonstrate the ongoing popularity of 50s styles and then you'll have some great pics to show too. And show them some jewellery, particularly anything with lots of sparkly rhinestones and rings. In my experience as a vintage seller, older women absolutely LOVE rings. Wonderful ideas, but how are you gonna get it done in 30 minutes. The ladies are going to love being able to try on hats and jewelry. I'm sure they will have some wonderful memories to share with you. What a kind thing for you to do!! Your ideas are great! and if you are gonna have just 1/2 hour I guess you have plenty of activities, of course you have to take photos and show them to us! I guess the ladies must have some old accesories too, I'm sure they will enjoy your presentation. Perhaps you can also take music of Elvis and make them to dance, well if they still can do it but I?m sure they will enjoy listening Elvis' songs as you said they are his fans. luckily, my mother in law said that if I go over a half hour, that's okay! We're doing the presentation after dinner and yes, those gals LOVE to dance!! Even ladies in wheel chairs wiggle around and throw their arms up in the air. :) Thanks for all of the great ideas, everyone!! 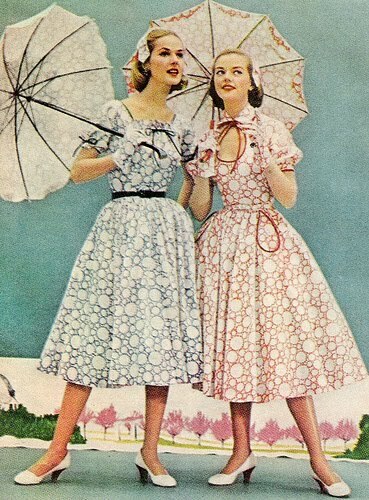 Oh, I love these dresses!